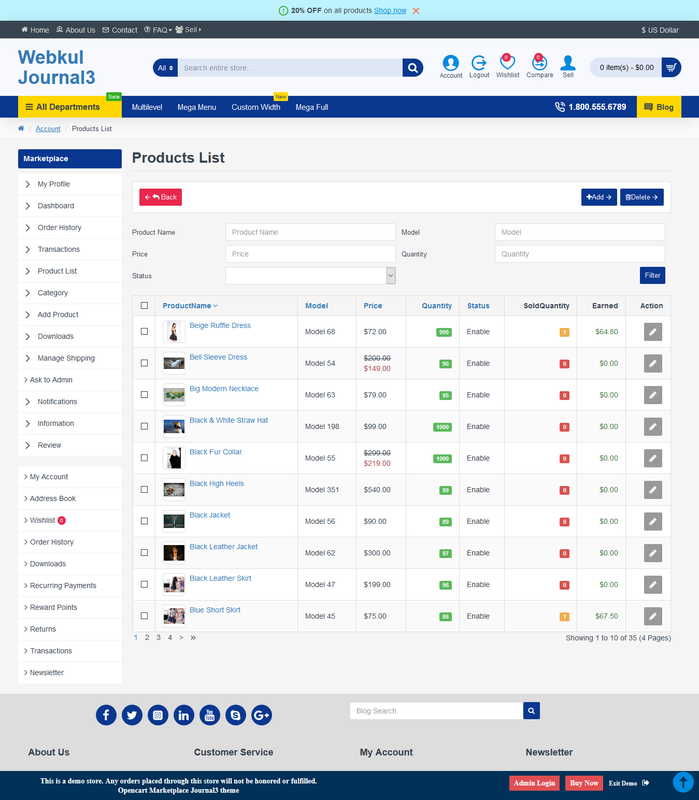 We have already written how the Opencart Marketplace works with the Journal 2 theme. As the theme is now updated to Journal 3 theme, this write up will take through the new updates. 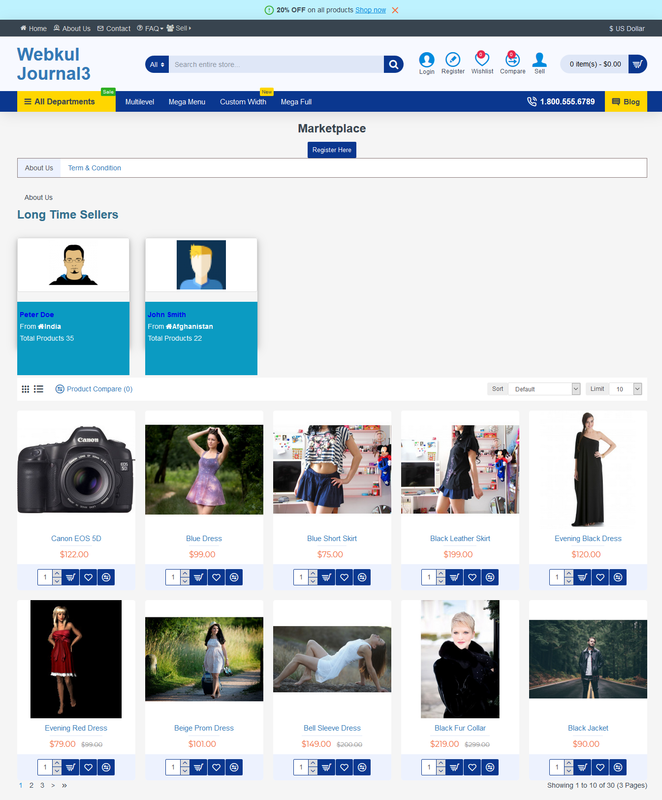 In this article, we will show how OpenCart Marketplace works with the Journal 3 theme. 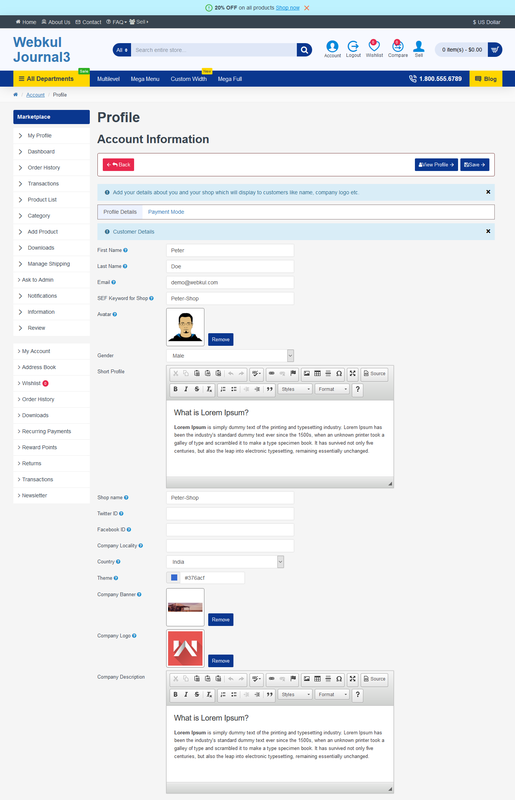 After the module installation, we can see that the theme is being reflected on every page on the front-end. Now let’s check the view of pages after marketplace module & Journal 3 theme installation. To sign up the seller will tap on the Register button and this brings up a pop-up. 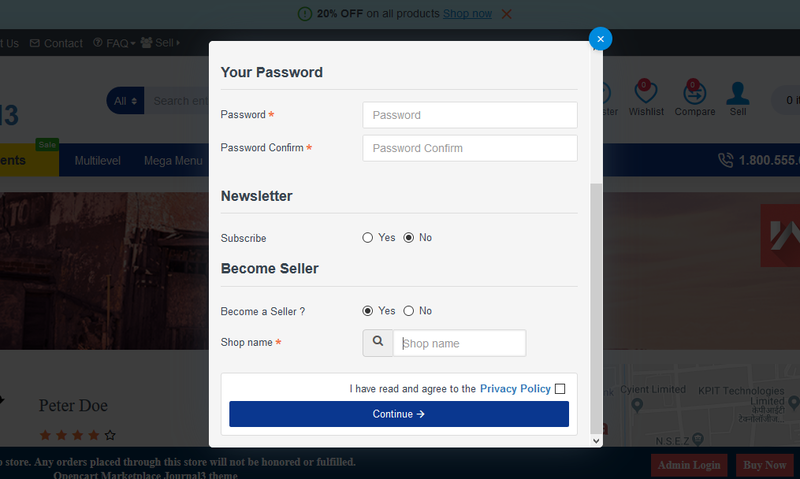 Here, the seller needs to select the Become Seller option as Yes and enter the Shop Name. After this, agree to the policy and hit the Continue button to register as a seller. 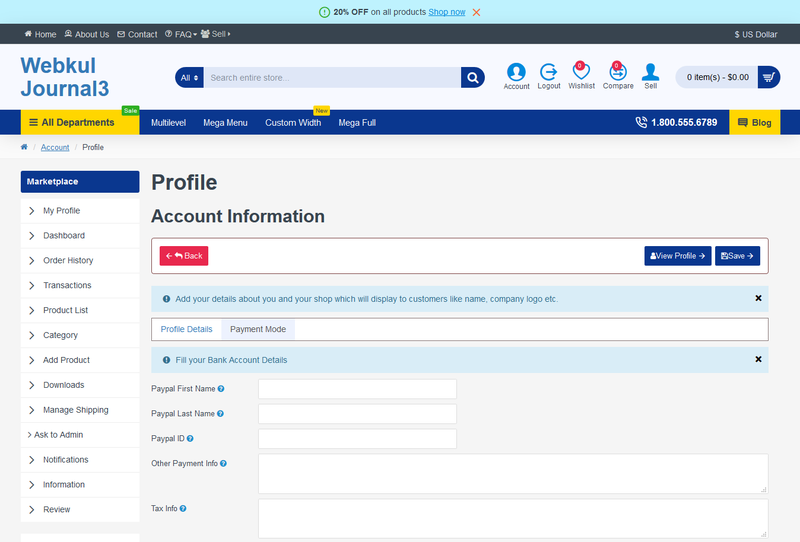 After the successful login, the seller will have his account panel on the right-hand side under the marketplace heading. Here, the seller can navigate to his concerned menu options by just clicking them. The seller can also switch between the seller and buyer account by tapping the toggle button on the left-hand side. 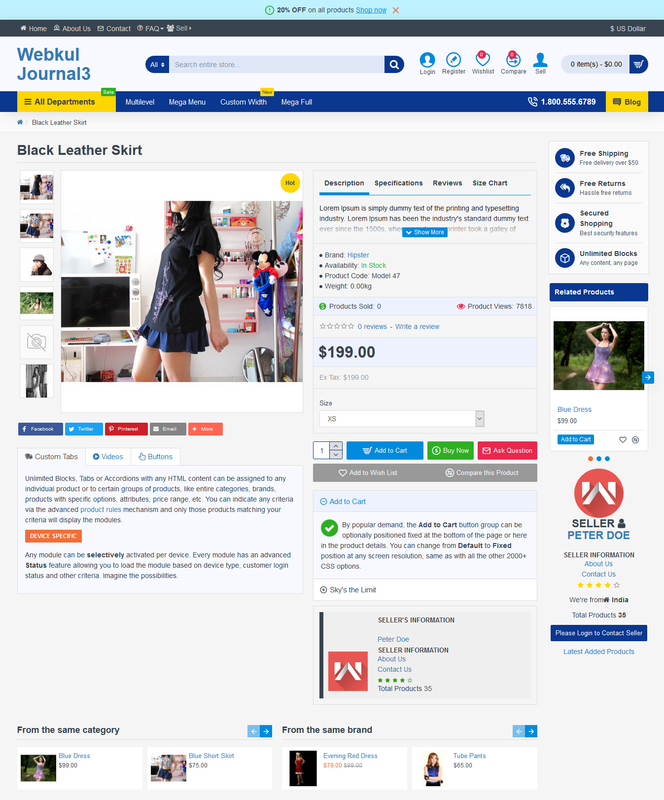 After the installation of the Journal 3 theme patch, the seller will have the Marketplace section as shown below in the snapshot. Here, the seller will be able to add his account information. 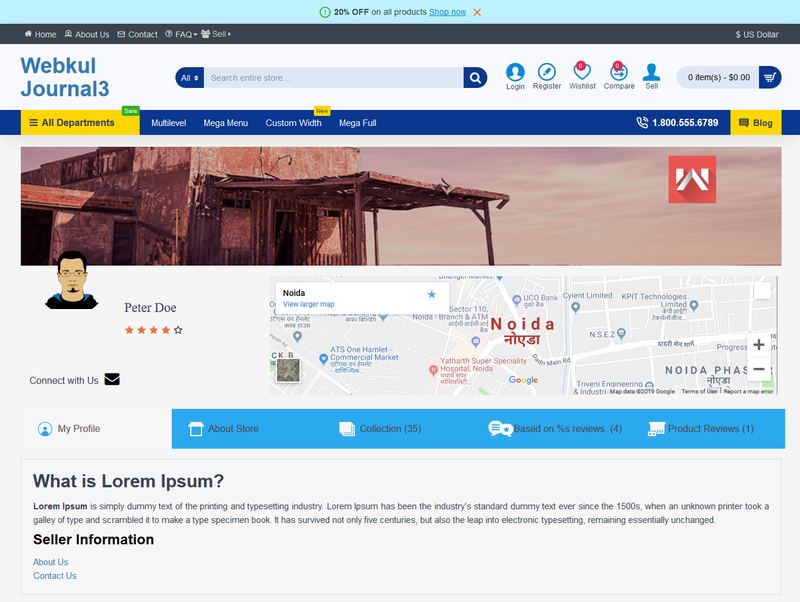 This includes – First Name, last Name, Email Address, Avatar, Gender, Short Profile, Shop Name, Twitter ID, Facebook ID, Company Locality, Company Theme, Company Banner, Company Logo, and the Company Description as shown below in the snapshot. The seller can also update his payment details by navigating to Payment Mode. Here, the seller can add his PayPal details and other payment info., and Tax information details. Please note that the PayPal Id is verified through the use of API. 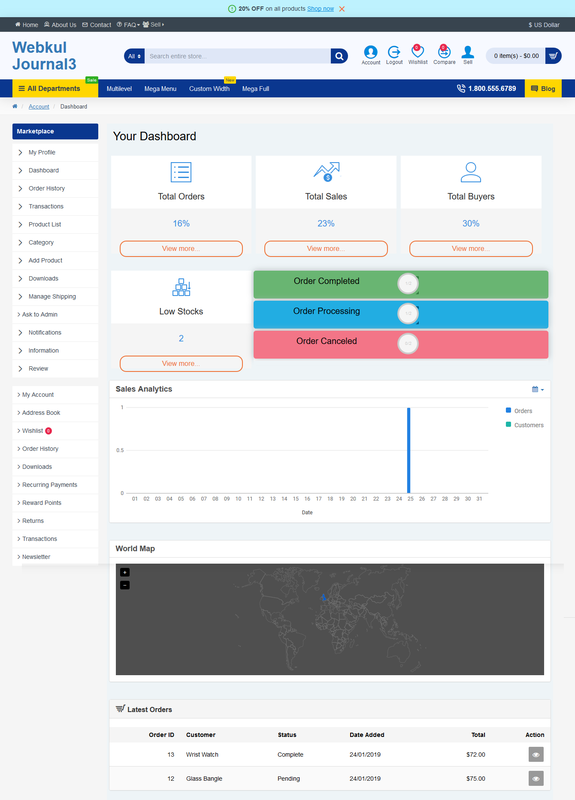 Under the dashboard, the seller can see his Total Order, Total Sales, Low Stocks, and Total Buyers. This is how the dashboard appears after installing the Journal theme. The seller can also see the number of completed – Orders, Processing Orders, and Orders Cancelled. Apart from these, the seller can see the sales analytics, world map and latest orders. View Order Details – Here, the seller will be able to view the order details as show below in the snapshot. The seller can change the order status, enter comment related to the order status, and can add tracking information as well. Here, the seller will be able to check the view the transaction amount and date for their completed orders. The seller can view the transaction amount only if admin paid to the seller. Under the product list section, the seller will be able to view all the products that the seller has already added. Here, the seller can edit any of the added products, add new products, or delete the existing ones. The seller can also filter the products using product name, price, model, quantity, and the status. 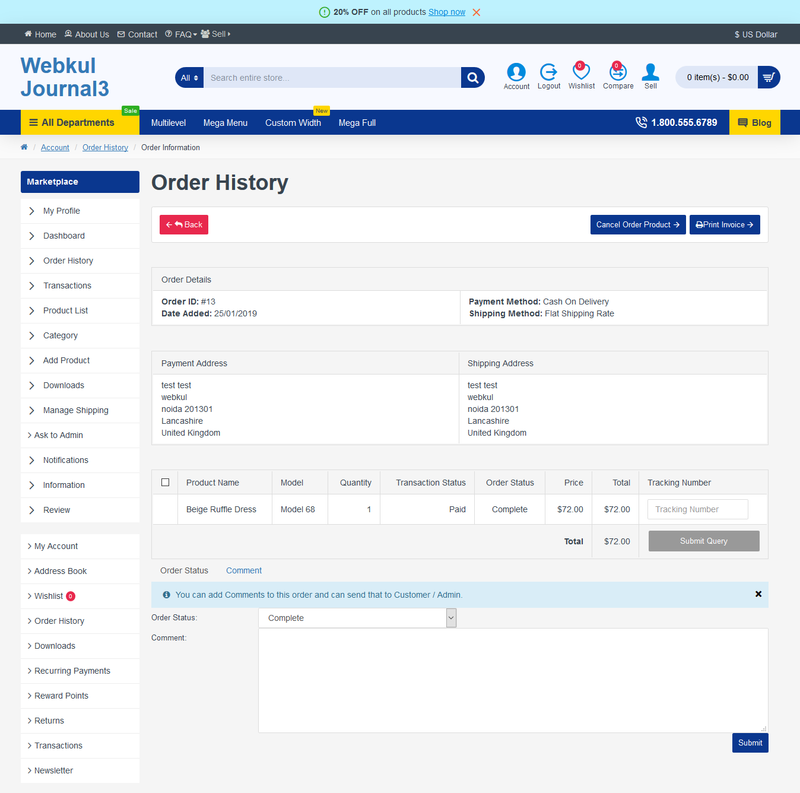 Here, the seller can add the product information using the various tabs available on the add new product page as shown below in the snapshot. Under this section, the seller will be able to see all of the added flat shipping rates and can add or delete the shipping rates as well. To add the shipping rates, the seller will set the status as enabled, set the flat rate, upload the CSV file, select the separator and then save it to save the zip codes. 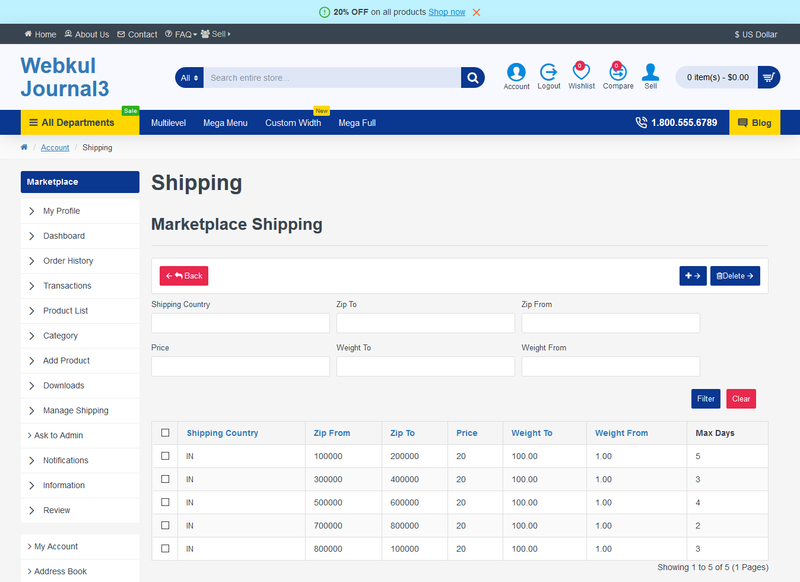 For a complete understanding check – How to create Marketplace Custom Shipping. Under this section, the seller will be able to ask the admin his queries. A pop-up will appear, and here the seller will enter the subject and enter the message for the admin. Tapping the Send button will send the query to the admin. Under this section, seller can check their notification of orders, product and seller reviews in this section. Sellers will get notified if order status changed, got a new review, product approved from the admin. Under this section, the seller will be able to check all the reviews that the customers have made for the seller. The seller can also filter the reviews by customer, status, and date added. The seller can also edit the reviews made buy the customers. Under this section, view the seller list as well as products of marketplace store. After clicking on sell link, the sellers can see the registration page where they can register and sell their products. Under the long time sellers, the customer can click on the profile image of a seller to check his profile page. This brings up the profile page of the seller with different sections like – My Profile, About Store, Collection, Based On%s Reviews, and Product Reviews. 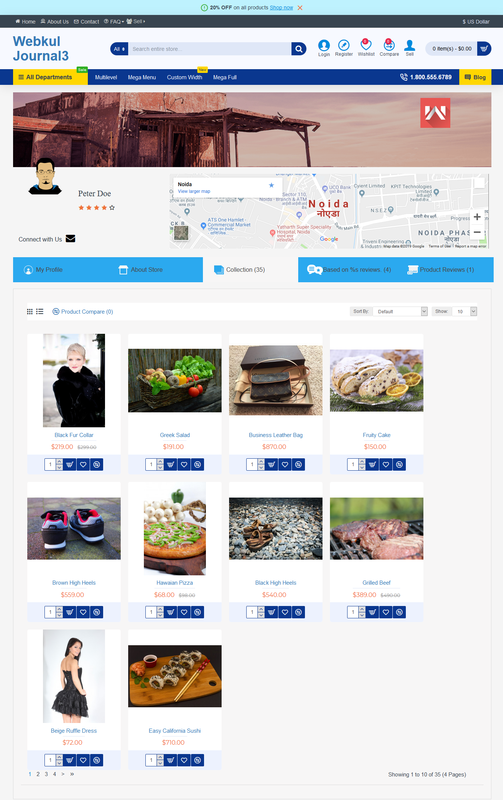 My Profile -Here, the customer can see the seller name, his profile image, his email address, and location on the map, etc. About Store – Here, check the details of the store. Collection – Here, check the collection of this particular seller. Seller Reviews – Under here, check the reviews that have been made for this particular seller by the customers. 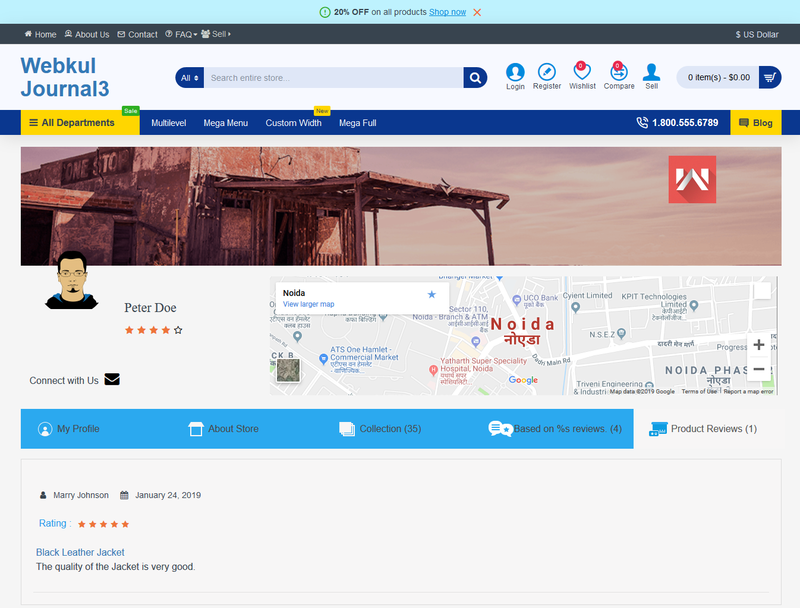 Product Reviews – Under this section, check the reviews that have been made for this particular seller’s products by the customers. On the product page, the customer can see product image, seller’s information, seller total products, the location of the seller. 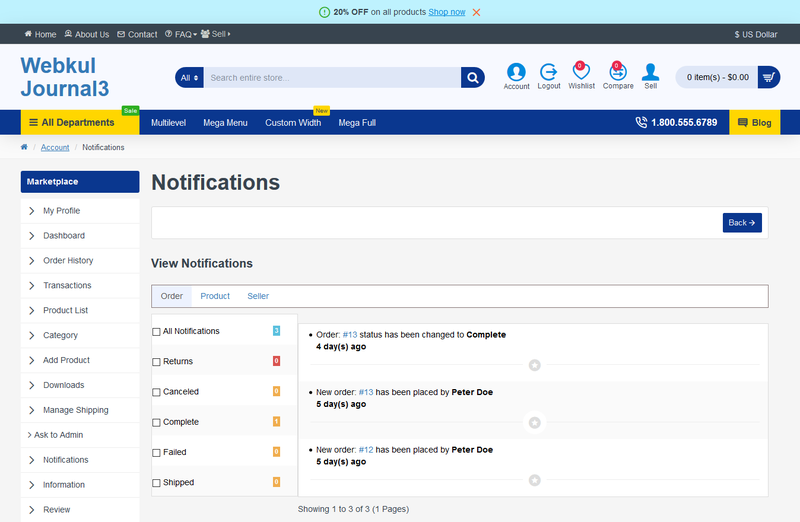 Please check the product page view below after integration with Journal theme. The seller created custom pages can be viewed by clicking the Pages under the seller information as shown below in the snapshot. 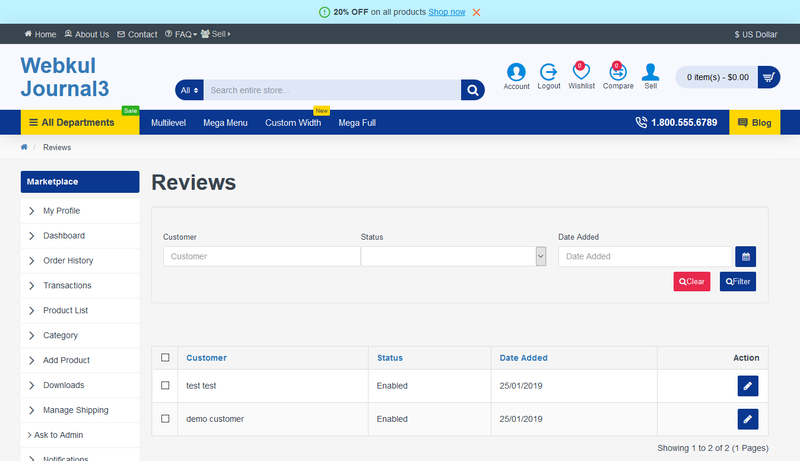 Check the working of the OpenCart Marketplace by checking it’s User Guide. 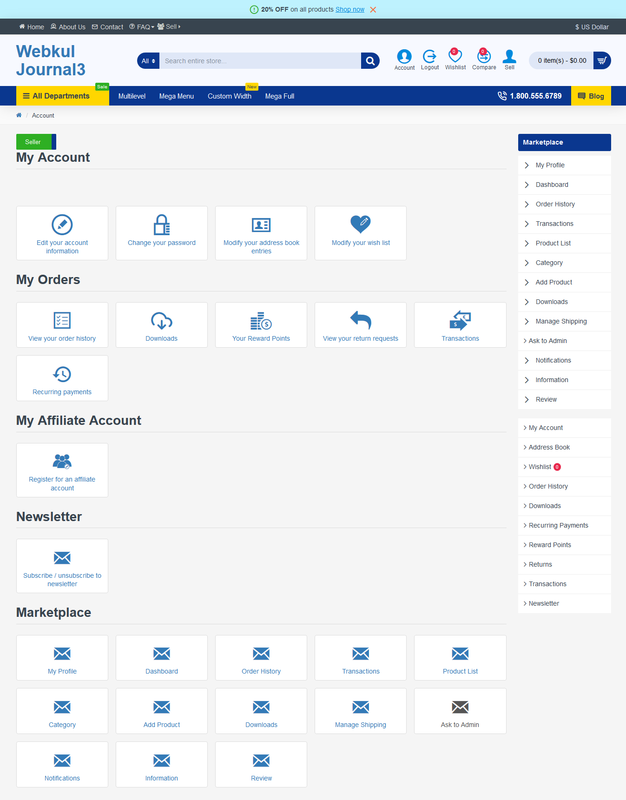 You can even refer here for Journal- Advanced Opencart Theme. 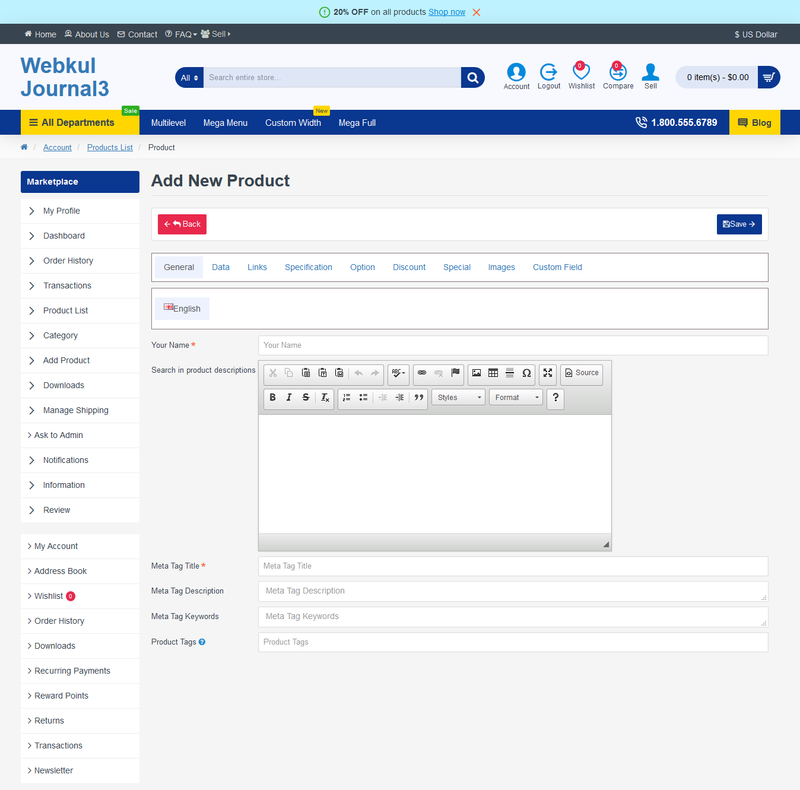 Also, if there is any Journal 3 theme compatibility issue with Webkul Opencart Marketplace module, then our support team will fix that issue for sure. 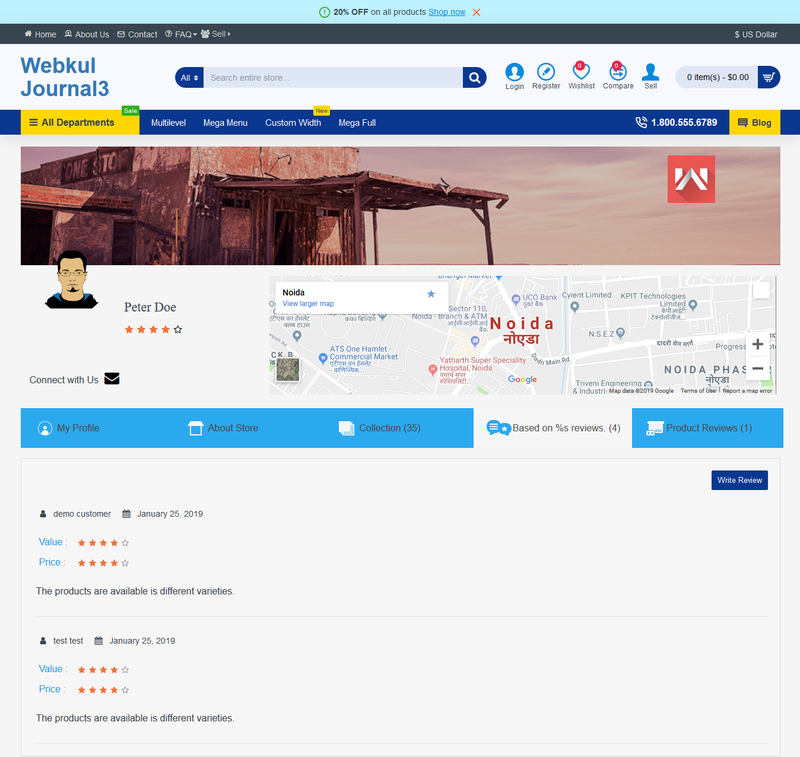 Kindly generate a ticket at https://webkul.uvdesk.com for any query or support.